Whether or not it’s worth investing in IPOs always seems up for debate. It almost certainly varies from company to company. However, one thing that most investors agree on is that IPOs are interesting to talk about and can be fun to follow. After several mostly dull years on the IPO front, 2019 seems like it could be quite a bit more interesting. We’ve already had Levi Strauss (LEVI) and Lyft (LYFT) come out with big IPOs. We could have Uber and Pinterest in the near future. Later in the year, we may get Airbnb, WeWork, Slack, and perhaps others. That’s quite a year for IPOs. Trading IPOs is nothing if not exciting – especially once the options are listed. That’s not to say that every IPO has multiple large magnitude moves after launching. But, IPOs where there’s no consensus agreement on the valuation can certainly have their share of volatility. This often takes place with companies which aren’t earning profits but have spent a ton of money already (in expenses). When the stock price is based entirely on future potential, opinions will vary greatly. How do you price hype? We’ve seen this situation play out with LYFT. The ride share company is one of two huge players in the space – the other one being Uber. The growth potential in the ride sharing space is vast. However, the company also has net losses of over $900 million. LYFT’s IPO price was $72, and it quickly climbed to as high as $88 on the day of the launch. However, the hype didn’t take long to fade, and the stock price quickly dropped below the IPO price. As I write this, the share price is all the way down to about $61. So, how do you trade a stock like Lyft with options? Can you take advantage of all the volatility? Is it worth the risk? At least one options trader thinks so. This trader purchased a straddle in LYFT, which makes money if the stock moves far enough either up or down from the strike price. By the way, a straddle is simply buying a call and put at the same strike, in the same expiration. 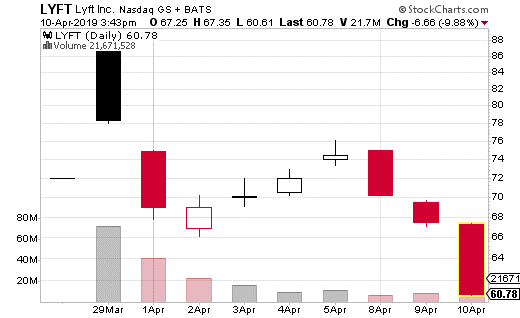 In this case, the trader purchased the May 10th 68 straddle in Lyft, with the stock price right at $68. Most of the time, you’ll see the straddle purchased at the strike that is closest to the actual price of the underlying stock, also know as the at-the-money strike. The cost of the straddle (the combination of the 68 call and put) was $9.53, which is certainly expensive. Of course, that’s what you’d expect from a stock that moves as much as Lyft has so far. The breakeven points for the trade are roughly $58.50 and $77.50. So, if the straddle moves beyond those points (and it’s currently already most of the way towards the lower the number) then the trade profits. About 250 straddles were purchased, so each dollar above or beyond the breakeven points will generate $25,000 in profits. However, the trader paid over $250,000 for these straddles and that premium is at risk the closer the stock closes to $68 at expiration. So – should you make a straddle trade in Lyft? Well, in this case, it looks like it was a successful gamble. You could still pay about $950 per straddle at whatever the current at-the-money strike is, but that’s clearly a lot of money to spend on one spread (strategy). On the other hand, Lyft has been sufficiently volatile to justify the price of the straddle so far. I wouldn’t make a habit out of trade like this, but doing a small amount (like 1 or 2 straddles) in a situation like this will likely work out in the short-term. The risk is certainly high due to the cost, but the rewards may also be substantial. For those curious, professional options traders may make a trade like this, but they’d hedge it with shares of LYFT. It’s a strategy called gamma scalping. It can work really well when there’s volatility, but can be costly and requires you to be at your screen for most of the trading day.